An interest in culturing human embryos to the blastocyst stage has always existed, in particular as there were always concerns as to the logic of transferring early-cleavage-stage embryos to the uterine environment. Limited data existed that indicated an improved pregnancy rate when placing blastocysts into the uterus. Buster et al. (21) recovered in vivo-developed human blastocysts by uterine lavage and transferred the same blastocysts to achieve a high implantation rate (3/5, 60%), well above that currently observed in most IVF cycles. Similar implantation rates have now been published using sequential embryo culture media by a number of clinics (22-24). Figure 4.2. 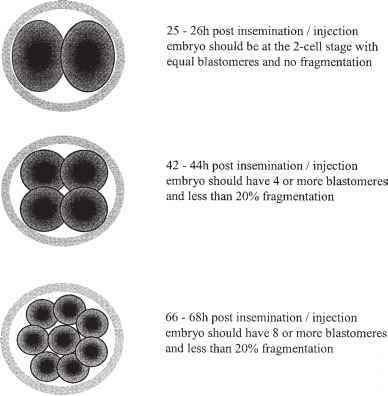 Outcome of embryo transfer related to the number of early cleaving (EC) two-cell human embryos. Open bars, pregnancy rate; solid bars, implantation rate. *Significantly different (p<.01) from the no early cleavage group. The number of cycles are in parentheses. The time of blastocyst development is evidently important, but forming a blastocyst per se is not the criterion most strongly associated with pregnancy outcome (Figure 4.4). In the mouse model several aspects of blastocyst development and physiology were quantitated and related to subsequent fetal development (25). 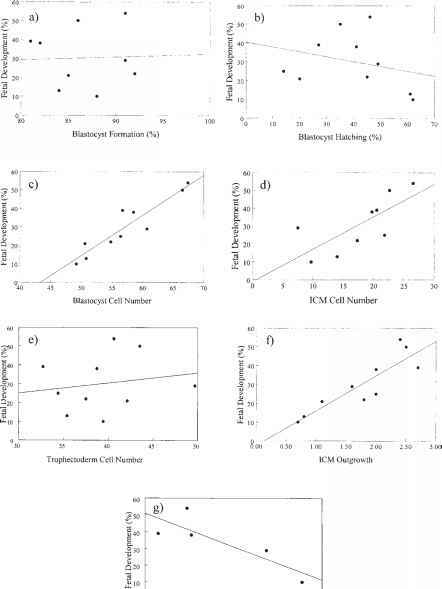 It was determined that total cell number, inner cell mass (ICM) cell number, and glycolysis had the strongest correlation with blastocyst viability. 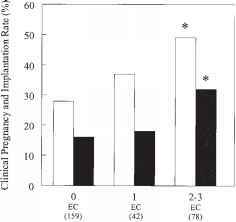 Blastocyst formation and hatching were poorly correlated with pregnancy outcome. be obtained, the crucial factor was when they became blastocysts. 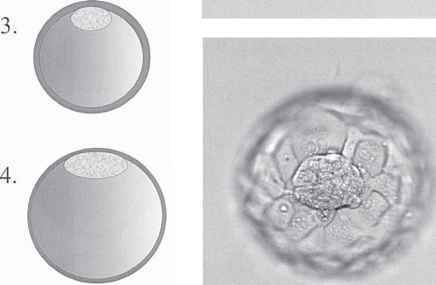 When taking this into account, the best blastocysts would be those that develop by day 5. In the bovine model it has also been demonstrated that those embryos that form blastocysts earlier are the most viable (29). A number of studies have attempted to investigate whether the embryos that are growing the best at the earlier stages of development are also those that reach the blastocyst stage. Although this seems logical, the results are not conclusive. For example, Graham et al. (30) reported that the criteria for embryo selection on day 3 seem to be inadequate for selecting blastocysts. In contrast, Shapiro et al. (31) found a predictive value of 72-h blastomere cell number on blastocyst development and success of subsequent transfer based on the degree of blastocyst development. Similarly, Langley et al. 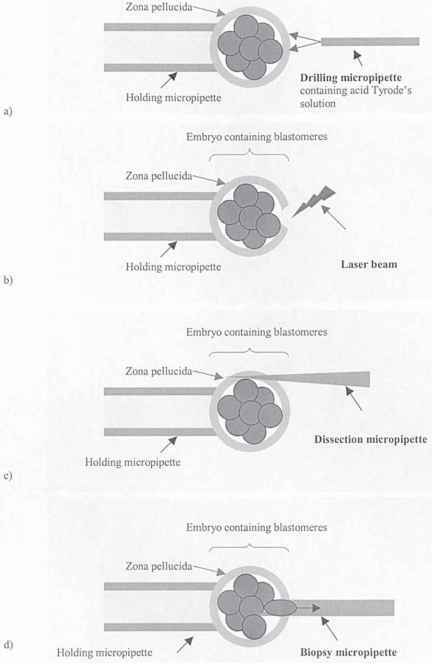 (32) showed that there was a relationship between embryo cell number on day 3 and the potential to form a blastocyst (Figure 4.6).